So we managed to get the last flight out of Mallorca yesterday morning, before all the planes were grounded. Gutting or what! The weather was fabulous, we were right in the middle of painting the shutters on the house and holiday mode was fully upon me. What a brilliant excuse, if ever there was one, for legitimately missing the Brighton marathon on Sunday. ‘Er yeah, like, I did all the training, but couldn’t fly back for the marathon. Bummer, man. Volcanic ash.’ Cast iron. But we made it, much to Emlyn’s relief. He was looking forward to a sofa moment with an Indian take-away and the TV debate between our oh-so-charismatic political leaders. I settled down too. I’m officially in carb-loading, so extra popadoms and nans for me. I’m all for watching TV history. I was a new-born when the first man landed on the moon, glued as a teenager to the OJ trial, plonked the kids in front of the inaugoration of Obama, but last night I couldn’t help feeling we were being short changed by the whole debate being on ITV. Call me a snob, but the Beeb are so much more professional at this type of thing. Everyone seemed very nervous – let’s face it, gurning Alistair Stewart is no David Dimbleby, or John Humphreys. Was I the only one who thought the whole thing was too long? I lost concentration after about an hour or so and I’m an interested party. I bet loads of people switched it off. I have to say that Nick Clegg was pretty charismatic, but at the end of the day, he’s a cheap salesman. He was using the same techniques I learnt at my first crappy job selling ad space. Make eye contact, use the questioners names, keep it personal. Hmmm….dubious. He tells us he’ll find all his policies by scrapping our nuclear programme, but that sounds a bit dodgy to me. It was clearly something the other two were keeping out of. As for Gordon trying to rile Dave about the campaign posters? How embarrassing was that! Mandy had obviously suggested he have a dig and get some mud slinging going, but it backfired. I can’t stand it when Gordon smiles. He looks like an aligator with toothache. To my mind it was all just a bit tame and staged. When they were discussing reforming the Houses of Parliament and the voting system, why didn’t either of the others point out that none of us have voted for Gordon as PM? A missed opportunity if ever there was one. So David Cameron gets my vote, although I can’t help feeling that his ‘cutting waste’ theme was rather scuppered by Nick’s pot-plants and paperclips comment. The whole evening ended in a triumphant moment of comedy, however, when Reeta Chakrabarti on the BBC news talked us through the silly squiggly lines generated by the floating voters and their handsets. A bloke who looked like a serial killer was sitting directly behind her staring at the camera. We couldn’t hear the analysis as we were rolling off the sofa in stitched. Hilarious. Is it just me, or has the level of road rage gone up? And rage in general? I entirely blame the Government, but more on that in a moment. The other weekend we were in London with our pals. We’d snuck out for Saturday lunchtime lemonades at The PV (the Princess Victoria, my fave West London pub) with all the kids – six in all between us. About an hour later, after all the crayons had been scattered liberally over the floor, the WOO had closed (that’s Window Of Opportunity in Rees speak), but we’d all had a lovely time. In a jovial mood we headed back out of the cosy pub to cross the Uxbridge Road. The traffic was heavy. Bumper to bumper. Lots of empty buses. The usual London glue. We waited at the lights and duly crossed at the green man. But it started flashing as we were only half-way across the road, at the same time as the amber light started flashing for the drivers. A man in a red car, keen to get going, started hooting us, then wound down his window. “Get out of the way you F******* C***!” he screamed at me. I put up my hand and asked him to wait. The Little One had fallen off her scooter on the way across road. The man honked his horn more persistently and screamed more abuse, revving the car, threatening to run us down. By the time we’d hurried all the kids across to the far pavement, most of them were crying. Of course being in heavy traffic, the driver had only managed to get twenty yards down the road. My noble husband morphed into a gorilla and gave chase and pounded on driver’s car window, demanding to know why he thought he had the right to swear at me and the kids. The man denied it, terrified now that he was hemmed in by buses and a very angry Mr Rees. The woman sitting next to him implored Emlyn not to wake up their baby in the back! The cheek of it. I was shaken and cross, but gratified that Emlyn had called the bloke on his unreasonable behaviour. He won’t be doing that again in a hurry, I hope. But let’s face it, I’m no saint myself. I’m aware that the problem of too many cars makes us all see red. More often than not I’m raging against the system as soon as I can’t park. And now, to add to my frustration, I’m now being pestered by a nuisance caller. Guess who? 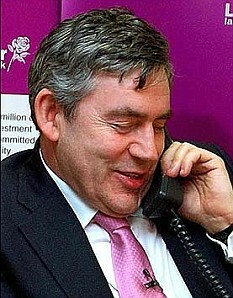 Yep, none other than Gordon Brown. I’m receiving recorded announcement messages up to ten times a day. A man, who sounds like he’s selling carpets informs me that I might qualify for a ‘Debt Relief Order’, a government initiative set up to help people ‘affected by the recent recession’ to eliminate 100 per cent of their debts within six months. I might qualify, he tells me. Except that I won’t. Because I pay my mortgage and my credit cards off and spend within my means. I never take the kids shopping and let them have what they want, and although I’ve had several dreamy crushes on new sofas, have never got actually bought one on credit. So I’m outraged at these calls. What makes me swear obscenities at this recording, is not the sheer numbers of these irritating calls, or my inability to track down the perpetrator, or my lack of knowledge as to whether it’s phoney or not, but the fact that the Government seems to be saying that it’s fine not to take responsibility for our financial actions, whether you’re a big bank, or a normal punter. And whose paying for this scheme and all these calls? Why, moi, of course. Grrrrr.